We’ve all been driving along, minding our own business when a rock the size of a melon comes flying like a targeted asteroid and smacks right into your windshield, leaving a chip or crack in your car’s visor and ruining your day. In reality, that rock probably wasn’t all that big, but driving at speed certainly makes the scene more dramatic. What’s not to be taken lightly is that mark on your windshield. Cracks and chips in your window may not seem like a big deal, but they impact your visibility and are a safety hazard. If you’re left with a serious imperfection on your windshield, it may be tempting to just ignore it or look around it to save time and money, but leaving the crack or chip and driving around with it is not an option. “Cracks and chips often grow longer or wider if not repaired or replaced,” explains Debra Levy, president of the Auto Glass Safety Council (AGSC). Not only that, but it’s also unsafe. 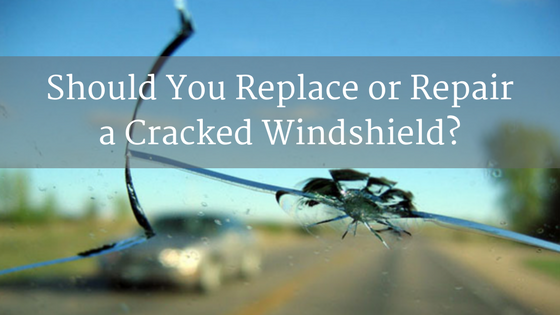 “The [cracked] glass may be compromised and the windshield is part of the safety system of the vehicle,” she explains. There are two main solutions to dealing with a broken windshield. You can either fill a crack if it’s small enough, or you can replace the whole windshield. The latter is the more expensive option, while the former is for smaller imperfections. It’s like dealing with serious body damage or chipped paint, but your windshield is much more important in terms of your safety than your car’s paint is. “Whether or not a break can be repaired, rather than replacing the glass, depends on a number of factors including type of break, location of break and amount of time the glass has been broken,” Levy says. But what’s important is that it gets fixed soon, as Levy explained that cracks and chips can grow longer or wider if not repaired or replaced. The decision to repair a crack or chip can be easy to make depending on the size of it. “The Repair of Laminated Auto Glass Standard allows repair of cracks 14 inches or less,” she explains, so cracks that are larger than that will need a complete replacement of glass. Obviously, the ability to repair such big cracks or chips is dependent on the skills of the auto glass technician you’re using. Most one or two inch chips are commonly dealt with, but again, it depends on what your tech says is possible. “Certain insurers also limit the length of damage they will pay for.” That should help the decision. Some quick research shows that certain types of cracks and chips just can’t be repaired. For example, if the damage extends from the exterior pane of glass and penetrates the interior, it’s too deep to be repaired. Chips on corners or tight spots are often too difficult to repair too, so count those out. If a chip or crack has spread after the initial damage, that’s a clear sign the glass needs to be replaced. Also take into consideration things like temperature sensors, radio antennaes and other high-tech goodies that can be embedded into your windshield that can affect whether the glass can be repaired and increase the cost of a replacement. What’s involved with fixing or replacing a windshield? A crack or chip repair takes about 30 to 40 minutes and is performed by injecting a clear resin into it. When it hardens, the resin helps restore the integrity and smooth look of the glass. The resin is then polished and cured by UV light. If done properly, the chip or crack won’t be able to spread any further. Replacing a glass is a bit more of an involved process. After prepping the body of the car to prevent any damage, technicians will remove the windshield from the car. The seals and adhesives are also removed, and a primer is used on the bare frame, so a new glue and sealant can applied for the replacement glass. The new windshield is then fitted and bonded to the car. After the glass is fitted, most auto shops encourage a 60-minute wait time so that the windshield is properly attached to the car. Like dealing with an independent mechanic, one of the biggest worries with autoglass repair is having a trustworthy technician. Fortunately, the ASGC has a website where you can find certified and qualified technicians in your area. “[To] choose a company that does the work properly, just go to the AGSC site safewindshields.org and put in your ZIP code.” says Levy. A handy search tool, these companies should be able to help you feel satisfied with your decision to fix or replace your windshield, and understand the importance of doing so.